The Carl Martin 3-Band Parametric EQ/Pre-amp is designed specifically for use with such acoustic instruments as guitar, violin, and harmonica. These instruments sometimes use combo amps, which require a high-quality EQ (3-band parametric) and balanced line driver. These features have been integrated into a convenient stompbox format with both XLR and 1/4" outputs. 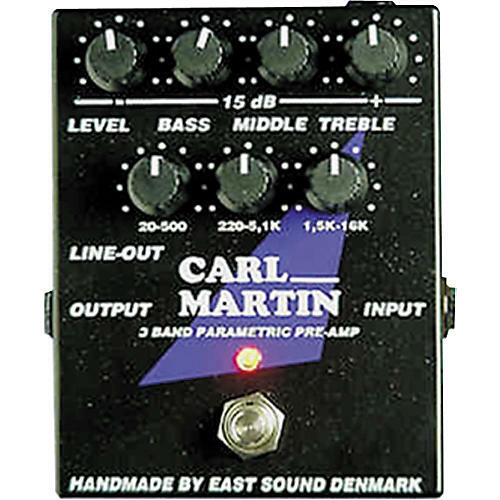 The Carl Martin Parametric EQ/Pre-amp also works well for tweaking the sound of electric guitars, basses, and other electronic instruments in the studio. Integrated regulated power supply.